Giorgio Vasari, whose prime loyalty was always to Michelangelo, begins his Life of Raphael of Urbino in The Lives of the Artists, second edition published in 1568, by trying to distinguish Raphael and Michelangelo: "The liberality with which Heaven now and again unites in one person the inexhaustible riches of its treasures and all those graces and rare gifts which are usually shared among many over a long period is seen in Raphael Sanzo of Urbino, who was as excellent as gracious, and endowed with a natural modesty and goodness sometimes seen in those who possess to an unusual degree a humane and gentle nature adorned with affability and good fellowship and good-fellowship, and he always showed himself sweet and pleasant with persons of every degree and in all circumstances. Thus Nature created Michelangelo Buonarroti to excel and conquer in art, but Raphael to excel in art and manners also. . . . In Raphael . . . the rarest gifts were combined with such grace, diligence, beauty, modesty and good character that they would have sufficed to cover the ugliest vice and the worst blemishes. We may indeed say that those who possess such gifts as Raphael are not mere men, but rather mortal gods, and that those who by their works leave an honored name among us on the roll of fame may hope to receive a fitting reward in heaven for their labors and their merits" (Everyman edition, vol. 2, 221). During the sixteenth century, Michelangelo bestrode the art world like a colossus, and artists desperately sought to learn how to understand his works by making drawings of them and studying them, seeking there inspiration and the ability to please patrons who demanded they achieve the effects that Michelangelo's paintings and sculptures had. Raphael, who according to Vasari, finally achieved a more perfect grace in painting after Bramonte allowed him to see Michelangelo's unfinished Sistine Chapel ceiling frescos, allowed him to transcend "sweetness" and to achieve a "new style, considerably finer and more magnificent than his first" and to produce works with "more majesty" (2: 231) and a "singular beauty" and a "delicate loveliness" (2: 235). Vasari praises Raphael for realizing that even if he could imitate Michelangelo successfully (as he had Leonardo), yet he could still make use of his natural gifts to produce beautiful works of a different style, unlike the many who tried and tried and failed and failed to imitate Michelangelo. For Vasari, Raphael is a model for the painters of the age of Michelangelo: by learning to do what Raphael could do by nature, others might "rise superior to disadvantages as Raphael did by his prudence and skill. . . . [E]veryone should rest contented with doing the things for which he has a natural bent, and ought not to endeavor out of emulation to do what does not come to him naturally, in order that he may not labor in vain, frequently in shame and loss. Besides this, he should rest contented and not endeavor to surpass those who have worked miracles in art through great natural ability and the especial favor of God" (2, 246). Raphael, in a sense, becomes the model for the post-Michelangelo artist, who should learn to accept his own human limitations, strive to make the most of his talents, and so, like Raphael, make works of art that can please and excite admiration. Raphael, in a sense, becomes Vasari's ideal model for those painters who have the problem of living in a world dominated by the inimitable Michelangelo but who can succeed by working to develop through imitation and hard work their own natural graces. In an essay published in The Cambridge Companion to Raphael, Bette Talvacchia uses Vasari's Life of Giulio Romano, Raphael's former chief assistant, to suggest what Raphael's workshop practise must have been like: "In assigning his assistants a more substantial role in the labor-intensive procedure of turning out hundreds of preparatory drawings for frescoes, Raphael initiated them into a rigorous working method, which they perpetuated as independent masters. The process devised by Raphael was to execute preliminary, rough sketches, proceed with further consideration of the groupings and individual figures through studies from life (often garzoni in appropriate poses), and then combine the compositional arrangements with the figural studies to form modelli" (p. 178). Vasari also tells us that Pinturicchio asked Raphael (because "he knew him to be an admirable draughtsman") to draw some of the cartoons for his fresco cycle on the life of Pope Pius II in the Duomo in Siena (Vasari, II: 223). One of the cartoons (c. 1504) still extent in the Malcolm Collection in the British Museum is the cartoon for the 4th fresco, in which Aeneas Silvius Piccolomini, the future Pope Pius II, is sent by the Emperor Frederick III to Pope Eugenius IV. The fresco shows Aeneas Silvius kneeling in front of the Pope to kiss his slipper; on either side of the Pope there are five seated clerics wearing robes similar to those worn by the figure in our drawing. Our drawing seems to be just such a rough sketch (perhaps of one of the workshop assistants), to get the feel of a seated figure seen from the side. Joannides' "Complete Catalogue" of Raphael's drawings lists and illustrates 459 drawings. However Anna Forlani Tempesti's chapter on "The Drawings" in The Complete Works of Raphael (NY: Reynal, 1969), 303-428, suggests how limited our knowledge of Raphael's corpus of drawings may be: "Some hundreds have come down to us . . . and are certainly nothing more that a part of the drawings that Raphael made or had made, sometimes retouching them and in all cases supervising them personally in his workshop. 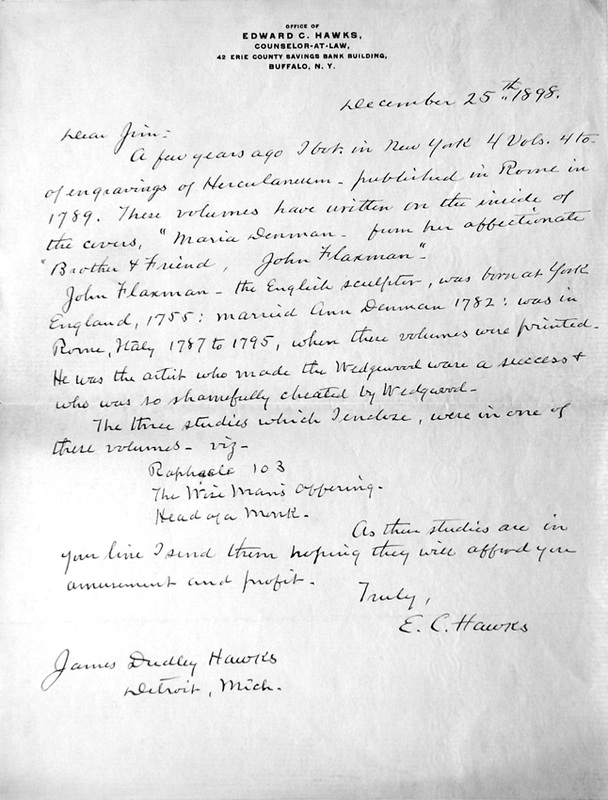 What with sketches, studies, models, and and cartoons, there must have been many more, and this is attested by the various copies of originals that are no longer known, and by the occasional lacunae regarding some works and certain periods, unexplainable unless by the loss of entire groups" (303). Her listing of some of the known 16th and 17th century collections of Raphael's drawings makes a very suggestive argument in her support. Raphael's friend, Timoteo Viti owned at least 48 folios of Raphael's drawings, some of which were copies or outright forgeries made or commissioned by Timoteo himself. In the mid-16th century, Giacomo Strada purchased from Perino del Vaga's widow "two boxes of drawings . . . all drawn by Perino himself and by Raphael, who had been his teacher" (304). Similarly he owned "a large number of drawings . . . purchased from the son of Giulio Romano in Mantua, 'where there were gathered the most beautiful things of Raphael of Urbino' " (304). In the early 17th century, a number of Raphael's drawings went into the collections of King Charles I of England and the Earl of Arundel who shared a passion for art collecting; many of these were dispersed during the English Civil War and its aftermath, and many probably ended up in France. Tempesti mentions, as examples, the 640 sheets attributed to Raphael and his school and the Crozat collection, which included 155 drawings by Raphael, which are among those still known today (304-305). It seems more than likely that during the 17th and 18th centuries, many drawings by Raphael might have been available for purchases in Italy and many purchasers eager to obtain them, including, one imagines, artists making the grand tour or settling in for an extended stay of study and work amidst the monuments of the high Renaissance with a particular interest in the works of Raphael. As of an auction at Christie's (London) on 8 December 2009, Raphael holds the world record for highest price received for a drawing at auction: £29.2 million or over $47,900,000. Now, almost 3 years later, we are beginning to get a better idea of what this portends: last week (12/5/12) another Raphael drawing sold for $47,800,000 at auction in London. As Carol Vogel reported in the NY Times on 12/4/12, "A Renaissance drawing from one of the most famous collections in Britain sold at Sotheby’s in London on Wednesday night for $47.8 million, slightly more than twice its high $23.8 million estimate. Four bidders fought for 17 minutes to win Raphael’s “Head of Apostle,’’ a study dating from around 1519 that was created for a figure in one of the artist’s greatest late paintings, “Transfiguration,’’ which belongs to the Vatican Museum in Rome. The drawing, in black chalk, was from Chatsworth, the Derbyshire home of the Duke of Devonshire (who is deputy chairman of Sotheby’s board of directors). It had belonged to the Duke’s family since William Cavendish, the 2nd Duke of Devonshire, acquired it sometime either late in the 17th century or early in the 18th. “Head of Apostle’’ isn’t the first drawing by Raphael to achieve a staggering sum. “Head of Muse,’’ a study for a figure in “Parnassus,’’ one of four frescoes also in the Vatican, brought a slightly higher price  $47.9 million  when it was bought by the New York financier Leon Black at Christie’s in London three years ago. Select Bibliography: Mario Albertario, Raphael, trans. Jeffrey Jennings (Milan: Electa, 1996); David Alan Brown, Raphael and America (Washington D C : National Gallery of Art, 1983); Richard Cocke, Raphael (London: Chaucer Press 2004); Richard Cocke, The Complete Paintings of Raphael (NY: Abrams, 1966); Jean-Pierre Cuzin, Raphael: His Life and Works (Secaucus NJ: Chartwell Books Inc , 1983); Bernice Davidson, Raphael's Bible: A Study of the Vatican Logge (University Park: Pennsylvania State University Press, 1985); Leopold D. Ettlinger and Helen S. Ettlinger, Raphael (Oxford: Phaidon Books, 1987); Michael P. Fritz, Giulio Romano et Raphael: La Vice-Reine de Naples, trans Claire Nydegger (Paris: Editions de la Reunion des Musées Nationaux, 1997); Rona Goffen, Renaissance Rivals: Michelangelo, Leonardo, Raphael, Titian (New Haven: Yale University Press, 2002, 2003); Marcia B. Hall, After Raphael: Painting in Central Italy in the Sixteenth Century (Cambridge: Cambridge University Press, 1999); Mab Van Lohuizen-Mulder, Raphael's Images of JusticeHumanityFriendship: A Mirror for Princes for Scipione Borghese (Wassenaar: Mirananda, 1977); Jürg Meyer Zur Capellen, Raphael in Florence (London: Electa / Abbeville, 1996); National Gallery of Art Studies in the History of Art Vol. 17: Raphael Before Rome, ed. James Beck (Washington DC: National Gallery of Art, 1986); Bartolomeo Nogara, Raphael: Stanza della Signatura (Vatican City State: Polyglot Vatican Press, 1950); Konrad Oberhuber, Raphael: The Paintings (Munich: Prestel-Verlag, 1999); Adolf Paul Oppé, Raphael (London: Methuen, 1909); Loren Partridge & Randolph Starn, A Renaissance Likeness: Art and Culture in Raphael's Julius II (Berkeley: University of California Press, 1980); Lisa Pon, Raphael, Dürer, and Marcantonio Raimondi: Copying and the Italian Renaissance Print (New Haven: Yale University Press, 2004); John Pope-Hennessy, Raphael (NY: Harper & Row, 1970); John Shearman & Marcia B. Hall, ed., The Princeton Raphael Symposium: Science in the Service of Art History (Princeton: Princeton University Press, 1990) ; Jacques Thuillier et al, Raphael et l'art francais (Paris: Editions de la Reunion des Musées Nationaux, 1984). Drawings: Roseline Bacou, Autour de Raphael: Dessins et Peintures du Musee Louvre (Paris: Editions de la Reunion des Musées Nationaux, 1984); Martin Clayton, Raphael and his Circle: Drawings from Windsor Castle (London: Merrell Holberton, 1999); J. A. Gere, Drawings by Raphael and His Circle From British and North American Collections (NY: Pierpont Morgan Library, 1987), Paul Joannides, Raphael and His Age: Drawings from the Palais des Beaux-Arts Lille (Cleveland: Cleveland Museum of Art, 2002); Paul Joannides, The Drawings of Raphael: With a Complete Catalogue (Berkeley: University of California Press, 1983); Marcia B. Hall, ed. The Cambridge Companion to Raphael (NY: Cambridge University Press, 2005); Philip Pouncey and J. A. Gere, Italian Drawings in the Department of Prints and Drawings in the British Museum: Raphael and His Circle: Giulio Romano, G F Penni, Perino del Vaga, Giovanni da Udine, Tommaso Vincidor, Polidore da Caravaggio, Baldassare Peruzzi, Timoteo Viti, and Girolamo Genga Also Sebastiano del Piombo, 2 vols. (London: British Museum, 1962); Queen's Gallery, Buckingham Palace, Drawings by Michelangelo, Raphael, and their contemporaries (London: Lund Humphries, 1972). On our 27"monitor, this is about life size. See enlarged version below. 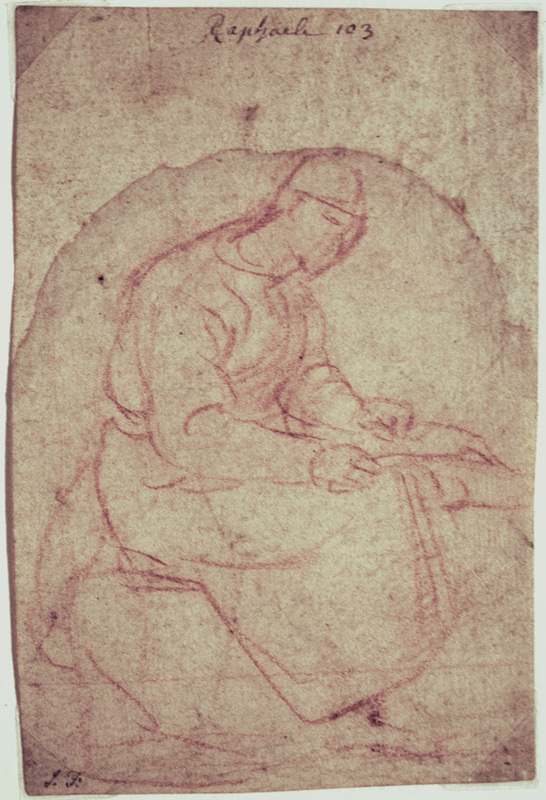 The drawing seeems to relate to Raphael's drawings made at Pintoricchio's request (c. 1504) for him to use in his fresco cycle on the life of Pope Pius II in the Duomo in Siena (Vasari, II: 223 [Everyman edition]). In particular, see the 4th fresco, in which the future Pope Pius II is sent by the Emperor Frederick III to Pope Eugenius IV. The fresco shows Aeneas Silvius kneeling in front of the Pope to kiss his slipper; on either side of the Pope there are five seated clerics wearing robes similar to those worn by the figure in our drawing. In an essay published in The Cambridge Companion to Raphael, Bette Talvacchia uses Vasari's Life of Giulio Romano, Raphael's former chief assistant, to suggest what Raphael's workshop practise must have been like: "In assigning his assistants a more substantial role in the labor-intensive procedure of turning out hundreds of preparatory drawings for frescoes, Raphael initiated them into a rigorous working method, which they perpetuated as independent masters. The process devised by Raphael was to execute preliminary, rough sketches, proceed with further consideration of the groupings and individual figures through studies from life (often garzoni in appropriate poses), and then combine the compositional arrangements with the figural studies to form modelli" (p. 178); for an example of using members of his workshop as models, see Thomas P. Campbell, Tapestry in the Renaissance: Art and Magnificence (NY: Metropolitan Museum of Art, 2002), figure 21, p. 208; for the process by which the tapestries were designed and realized for the tapestry makers in Brussels, see pp. 189ff . Our drawing seems to be just such a rough sketch (perhaps of one of the workshop assistants), to get the feel of a seated figure seen from the side. For a similar use of chalk to outline a figure, see Joannides 1983 #17, upper left. 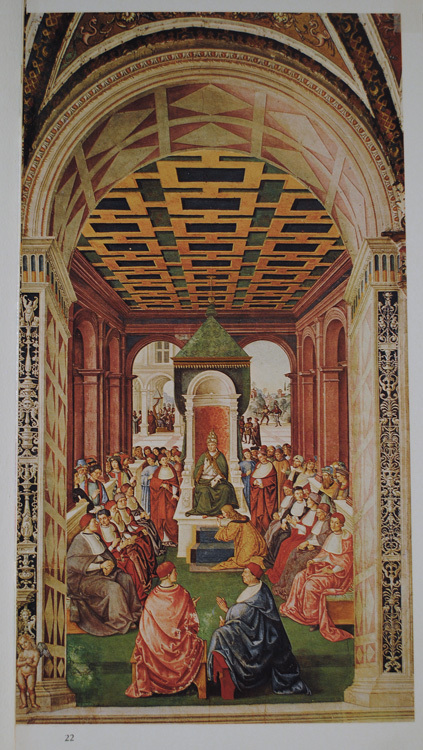 For the Pinturrichio frescoes, see either The Piccolomini Library in the Cathedral of Siena: The History of Pope Pius II in the Ten Frescoes of Pinturicchio (Siena, 1938) or Pietro Scarrpellini, Pintoricchio all Libreria Piccolomi (Milano: Fratelli Fabbri, 1965), p. 22. 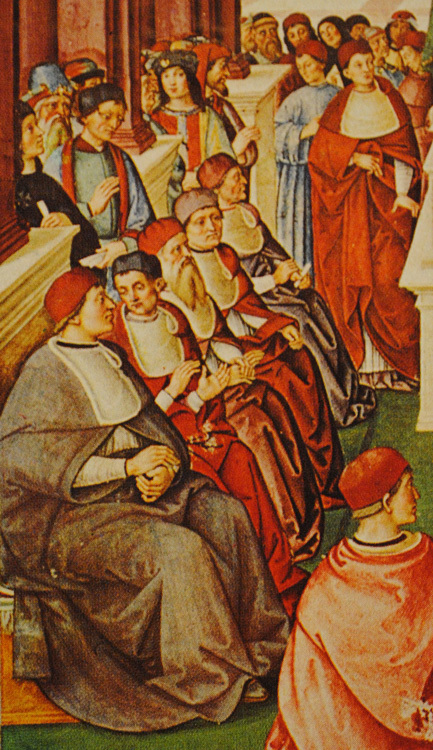 For additional seated cardinals in similar garb (though in different postures, see p. 38). For a reproduction of one of Raphael's cartoons, see Rhoda Eitel-Porter, ed. From Leonardo to Pollock: Master Drawings from the Morgan Library (NY: The Pierpont Morgan Library, 2006), pp. 26-27. Pietro Scarrpellini, Pintoricchio all Libreria Piccolomi (Milano: Fratelli Fabbri, 1965), Enea Silvio Piccolomini presented to Pope Eugenio IV (p. 22). See detail below. We believe that our drawing may be a rough sketch for the seated figures on the left side of the composition in the final version Raphael did for Pintoricchio. John Flaxman (England, 1755-1826) was "the most famous English Neo-classical sculptor of the late 18th century and the early 19th. He . . . became noted for the piety and humanity of his church monuments. He also had an international reputation based on his outline illustrations to the works of Homer, Aeschylus and Dante, which led him to be described by Goethe as the 'idol of all the dilettanti' " (David Bindman, "John Flaxman," Grove Dictionary of Art 11: 162-65; here at 162). Flaxman was in Rome from 1787-1794 and would have had opportunities to purchase Italian Renaissance drawings; one assumes that he also would have had a discerning eye that would help him distinguish between the real thing and later copies. See also David Bindman, ed. John Flaxman (London: Thames and Hudson, 1979). Raphael Workshop, Fragment: Putti at work and play. Pen and brown ink and wash on laid paper, c. 1515-25. Seven putti are busy at work putting flowers into a vase almost as big as each of them while five more are playing with a large cow: one riding it and putting a wreath on its head, perhaps for a sacrifice, two others are milking it, and two more are bringing another bucket over to continue the job. Part of another is visible at right in the damaged area, which extends upward over to the head of the putto putting the wreath on the cow. There are coats of arms top left and center: "MWF" (or "MWT") within a cartouche surmounted by a crown and again next to it on a standard. The scene seems similar to Giovanni da Udine's designs for a tapestry Triumph of Love executed by Raphael's workshop (Giovanni, Perino del Vaga, Giulio Romano, and Giovanni Francesco Penni). See Thomas P. Campbell, Tapestry in the Renaissance: Art and Magnificence (NY: Metropolitan Museum of Art, 2002), pp. 189ff for the process by which the tapestries were designed and realized for the tapestry makers in Brussels. With regard to the set of tapestries showing the Acts of the Apostles for the Sistine Chapel, where they would be hanging beneath Michelangelo's ceiling frescoes, Campbell suggests that Raphael would probably have wanted to design the cartoons himself, but suggests that he might have then delegated the final elaboration of the cartoons to his workshop based upon his designs (although he notes that "several of the drawings relating to the preliminary process for at least The Charge to Peter are by Raphael's pupils" [ p. 190]). However with the next set of tapestries for the Pope, The Triumphs of the Gods, "which was the first tapestry series in which the grotesques were applied as an all-over decorative formula" (p. 228), the rules appear to have changed. Following Vasari's statement that Raphael assigned the designs to Giovanni da Udine, Campbell suggests that although Giovanni may have been in charge of the "fanciful grotesque decorations," other artists who almost certainly must have been involved were Giovanni Francesco Penni and Perino del Vaga" and that since "so much of Penni's work seems to have been based upon compositional sketches by Raphael and Giulio Romano, we might also suspect that Giulio played a part in the conception of some of the figural groups" (p. 228). After the Grotesques, Raphael's studio turned to another set of designs for tapestries, the Giochi di Putti. In these works, again, the putti's antics are the central design feature of a twenty-piece set ordered by Pope Leo X featuring "Children at play and devices symbolic of his rule against a rich background of gilt-metal thread" (pp. 229-230). Since the tapestries for The Triumphs of the Gods and the Giochi di Putti are lost and all that survive are some of the cartoons, it is impossible to say with any certainty that our work may have been a part of either set, though the format of the drawing clearly fits the format of the tapestries and the images are appropriate to the description in the Papal inventories of "putti playing" and the style is appropriate for the works of Raphael's workshop. Partly pricked for transfer lower right. Cf. Marco Dente da Ravenna's 1519 engraving Bas Relief with Three Cupids reproduced in Tapestry in the Baroque: Threads of Splendor, ed. Thomas P. Campbell (NY: Metropolitan Museum of Art, 2002), p. 401. Image size: 135x335mm (5-5/16"x13-3/16"). Price $9500. As I took this new photograph, the drawing seems to have taken advantage of the moment to try to escape, middle first. Or to put that less dramatically, gravity seems to have been attracted to the middle of this wide drawing and pulled it slightly out towards the viewer as if wanting to share it. It really is two-dimensional, not three.